I received a call for help from a sweet lady named Linda Grisham. Her story was very interesting, the kind that tugs at your heart and keeps you from forming the word “No” as a response. Linda explained that her husband James was a woodworker and had built several Maloof style pieces of sculptured furniture. He’d finished several rockers and was working on a cradle when a drunken driver hit and killed him during one of his early morning bike rides near Carrolton, Georgia. 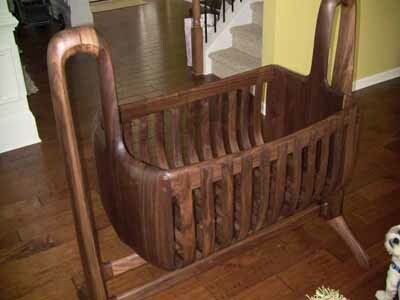 Linda asked if I would finish the cradle because their first grand child was due in June. See what I mean? Building the Andre Roubo Workbench Check out the August edition of The Highland Woodturner: Now Available!